If you sent a student off to college in 2014, chances are they are the new proud owners of all the must-have college devices: a laptop for taking notes in class, a smartphone for calling home and FaceTime or Skype, a tablet for reading and much more. But students will be students, and that means they need the ultimate in protection to take on tough studies right along with tough parties. We’ve got all the essentials so you can rest easy knowing you’re sending your student into the 2015 school year with the right protection for their must-needed school devices. And our ultra-protective cases all come you want in the trendiest colors – so your student can feel cooler than ever when taking on the New Year. SmartShell MacBook Pro with Retina Display cases add a thin layer of reliable protection without sacrificing style. Choose neon colors for an on-trend case or incorporate school colors for a spirited look. CandyShell Card for iPhone 5/5s, iPhone 5c, iPhone 6, iPhone 6 Plus and Galaxy S4 is the perfect choice for a busy college student. With so much going on and so much to bring to class with them, your student can carry all their essentials (student ID, cash and credit cards) in this ultra-protective and durable wallet case. MightyShell for iPhone 5 and iPhone 6 combines the best of what both parents and their college students want: 2x military-grade protection with trendy colors and a super slim design. It’s a gift everyone will be happy with! After a long day of classes, your student will want nothing more than to relax with some movies or TV and a good book. Get them a protective case that allows for hands-free viewing at multiple viewing angles, like our StyleFolio Kindle Fire HDX case. 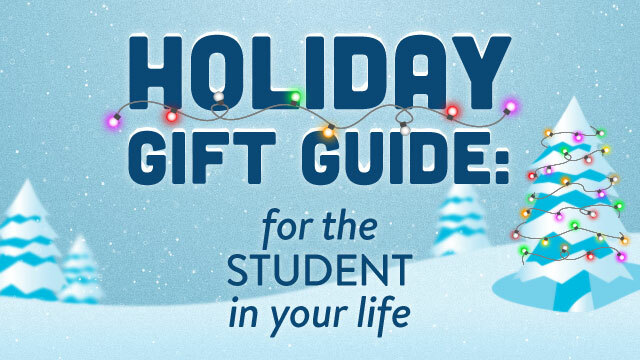 Still have more gifts on your list? Check Speck Buzz next week for our continuing gift guide series, packed full of gift ideas.